Emotional Reactions to School Shootings Should Lead to Positive ChangeãSo Why Donêt They? 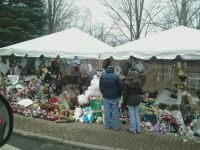 A memorial to the children killed at Sandy Hook. All forms of social media are lit up once again with reactions to the latest school shootings. These incidents, like so many before, have left us devoid of beautiful young lives full of promise. They have also left us with questions about gun control, male perceptions of women, and of course, mental illness. Why do these shootings evoke such strong reactions from us? How are they different from other acts of violence that we are faced with on a daily basis? Do we react the same to all school shootings or all mass shootings in America, or are there gradations in the level of emotional response? These are some of the questions I ask myself when these events occur. We live in a society where aggression is often a valued trait, violence is the norm in our television programs, video games, and films, and we have been engaged in an armed conflict somewhere in the world for most of our existence as a nation. But school shootings get under our bones. They are a painful reminder of our lack of control over one of our most prized possessions, if they can be called such—our youth. School shootings and mass murders by adolescents strip away our sense of safety and security in a way that is unparalleled by any other event except terrorist attacks on domestic soil. They are, indeed, a form of terrorism. For a few days or a few weeks, the circumstances leading to such violent acts tend to linger on the surface. Sometimes this public consciousness leads to the promise of change—change in gun laws, more money for research and education related to mental illness, calls to end bullying in schools. After a short period of time, the promise of action fades away and everyone, except the family of the victims or the perpetrator, return to a sense of normalcy. According to Terror Management Theory (Leary & Schreindorfer, 2008), these acts should make us more aware of our vulnerability and our own mortality, and should create anxiety. In the case of 9/11, we saw a significant spike in anxiety levels. Following the Columbine school shootings, many schools made ID cards a requirement and added metal detectors as a measure of safety and security. Once we have applied these little bandages, we as a society seem content to once again push aside thoughts of death. The problem is that these bandages often do not increase a sense of safety and security, especially for young people, and they usually do not address the root cause of the violence in the first place. This is our biggest illusion. We cannot prevent death, but we can prevent senseless death by making real and sustainable changes in our relationships with others and our environment. A few months ago, there was a terrible shooting of a young man on the campus of South Carolina State University in Orangeburg, South Carolina. He was shot and killed by another boy in front of his dorm in broad daylight. Neither SC State nor Claflin, the institution where I work and whose boundaries are separated, in some places, by a fence, were placed on lockdown until about two hours after the shooting. For some reason, this event did not cause widespread outrage and calls for change in the same way as did the Sandy Hook killings, the Columbine shootings, and the recent shooting in Isla Vista, CA. Young men who were in the getaway car with the shooter were charged with accessory to the crime and released on bond. One was a former student and he was back on our campus the next day. Students expressed concern about their safety. The illusion of safety in our little bubble was shattered, if only for a few days. The possibility of dying young, at the height of possibilities, gnawed at the edges of campus consciousness, but was quickly swept away by the latest update on students’ twitter feeds. The reality is that the boy who was shot, a football player and engineering student, will never graduate from college, carry out a career, or have a family. The same could be said for the shooter, and to a certain extent, the other young men who were involved. That one act cost too many lives, too many futures. As community, whether on the local, national, or international levels, we need to be talking about what triggers these events, what we can do to prevent violence, and how do we provide youth with a viable sense of safety and security so they can function in an academic environment. Safety and security is only a step above our basic physiological needs. Without safety and security, Maslow has argued, it is difficult for an individual to progress towards their highest potential. Without a sense of safety and security, students will become increasingly focused on fears and anxieties related to the threat of violence. Fear of becoming a victim of gun violence is very high in communities where young people have witnessed gun violence or know someone who has been a victim of gun violence. If we follow through with the ideas of mortality salience from Terror Management Theory, the relatively ambivalent responses to these shootings make sense. Pyszcznynski et al (1999) found that it is common for people to use defenses that remove death-related thoughts from consciousness. In other words, instead of acknowledging that we need to reform gun laws, or tackle our lack of support services for the mentally ill, which would require further thoughts about the shootings and therefore death, individuals will convince themselves that these incidents only happen elsewhere, or are isolated problems. We also get very defensive, lashing out at the perpetrators of violence as “monsters” and “sickos.” All this makes us feel better, but it does nothing to tackle the root problems. We need to move beyond emotional outcries after each school shooting, towards proactive responses to unwelcome threats to our mortality. Pyszczynski, T., Greenburg, J., & Solomon, S. (1999). A dual-process model of defense against conscious and unconscious death-related thoughts: An extension of terror management theory. Psychological Review, 106, 835-845.